shall be confined to age four or five. that follow up to the grave. feminity fatigues in the identity crises. and act what behooves of me with alertness before all. the household chores grip me like a python. Mercifully visits the work-weary eyes. I would be tethered to a post for display. inspecting and testing me, my body and my skills . and brothers look at me … as an impending calamity. how long can I stand donning the veil of smiles? I love the times I can stand on my feet. with the tiger that ensnares me. 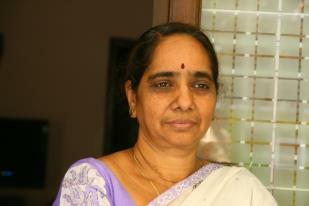 Dr. Silalolita is a Lecturer at GLR New Model College, Hyderabad. She was a columnist and working editor for Bhoomika, a reputed magazine in Telugu wholly run by women. Presently she is running a column in Maanavi, a monthly. బతుకు కొనదాకా వెంటాడే సంకెల — ఆడతనం. ఐడెంటిటీ క్రైసిస్ లో అలుపుతెచ్చే ఆడతనం. అన్ని అధికారాలమధ్యా రోజులు గుదిబండల్లా మారిపోతాయి. నన్ను చుట్టుకున్న పెద్దపులితో ఇక నా పోరాటం.